Nothing screams US Track and Field like remixed Nike Air Maxes. Alright, it doesn’t, but the whole Nike USATF project has been one of the best Nike Sportswear apparel lines to date. We liked that stuff before blogs went all wild for the sweatshirt because Kanye wore it, but the new apparel is equally powerful. Track and field isn’t generally something we associate with strong, punchy looks or style — in fact, the first things that come to mind are urine tests and Carl Lewis’ ill-judged music video, but since the USATF line debuted, giving a governing body more aesthetic appeal than a governing body should be given, via its military-style, no-nonsense looks that Nike co-founder Bill Bowerman would probably approve of, it seems to carry a certain cool. The aforementioned Mr. Lewis is one of the last pro athletes we saw actually run in a pair of Air Max, when he rocked AM97s for a retirement event the same year, but both he and Michael Johnson (then gunning to be the fastest man on the planet) plugged that shoe heavily when it debuted. There’s lighter, speedier more track-friendly Nike shoes out there, but for street usage the Nike Air Max is king. 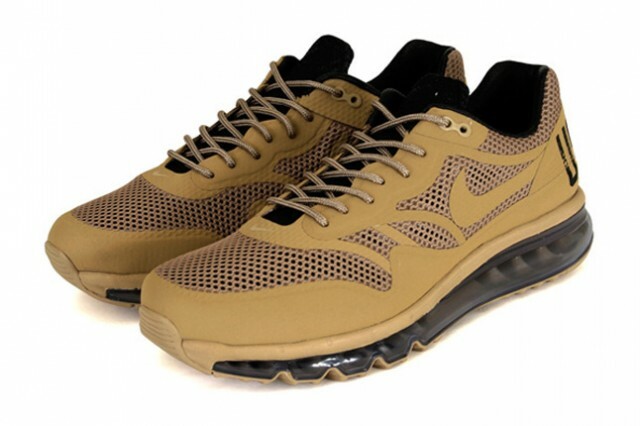 To add to the recent Air Max 1/Air Max 2013 hybrid from a month or so ago, this duo forms the rest of the pack. The Air Max 97 2013 brings Nike+ to an old favourite, and Hyperfuse upper works pretty well. Where that hybrid excels is in its expansion of the original full-length air cushioning to the new flexible, ultra cushioned unit that surpasses the 360 version and trumps the One Time Only set of shoes. The OG 97 air-bag ended up being used in the ’03 and ’04 editions of the Nike Air Max series too, but a decade on it feels downright primitive in terms of performance potential. The USATF Air Max 2013 is pretty solid too — mainly because it kicks that MAX heel branding to the kerb and the aggressive abbreviation here looks better. The military colours here stay matter-of-fact and those woven nylon tongues, plus that sockliner ENDURANCE, FORTITUDE, SPEED and VICTORY message link all three shoes in this set.